Wakehurst defender Niall Swan closes down former team-mate Conor Gregg during Saturday's Championship Two match against Moyola Park. 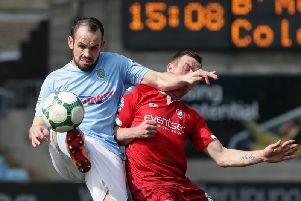 Wakehurst suffered a setback at the weekend in their attempts to pull away from the lower reaches of the NIFL Championship Two table. The Ballymena side were beaten 4-1 by their landlords Moyola Park in Saturday’s clash at Mill Meadow, with manager Paul Muir admitting it was “a bad day at the office”. Wakehurst went into the game minus the services of leading goalscorer Tiarnan Rafferty and his strike partner Nigel Turner, thereby blunting the team’s attacking threat. Despite that, the early exchanges were pretty evening for the opening half hour before Moyola took the lead from a glancing header from their 6’ 4” midfielder, who caused problems in the air throughout the entire match. The home side’s second goal came from what Wakehurst felt was a questionable penalty decision but Chris Dowie scored from the spot to leave the Ballymena men facing an uphill task to get anything out of the game. “We gave a debut to Nigel Elliot in the second half and his direct play meant we came into it. “However, again we suffered a sucker punch when we conceded an own goal to go 3-0 down,” said Muir. Moyola made it 4-0 from another set-piece before Wakehurst claimed their only crumb of consolation when they got on the scoresheet after Lee McClelland scored from the penalty spot. “It was a disappointing day however positives were performances of Nigel Elliot and Jordan Walker from the bench,” said Muir. The result leaves Wakehurst still occupying one of the dreaded bottom four places, the occupants of which at the end of the season will be relegated. Wakehurst can take a break from their league situation this week when they face Coleraine Reserves in the last eight of the Craig Memorial North West Cup.